That’s changed, though, in a big way. 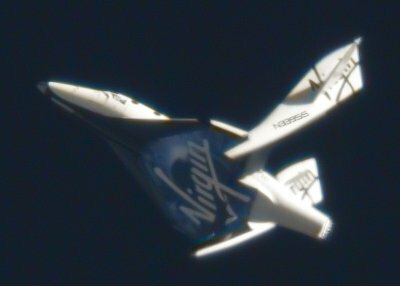 In less than three weeks, Virgin and Scaled have doubled the number of glide flights of SpaceShipTwo, with four flights between April 22 and May 10. Those flights included glide flights of longer duration on April 22 and 27, followed by the first flight of SpaceShipTwo that tested the vehicle’s ability to “feather” its wings, on May 4. That feathering, like that used on SpaceShipOne, rotates the tail section to a 65-degree angle, and is intended to provide for a stable reentry of the vehicle on suborbital spaceflights. On last week’s test, SpaceShipTwo flew in the feathered configuration for about 75 seconds before rotating the wings back to their normal configuration for landing. Scaled and Virgin followed up that test with another glide test, this time without feathering, on Tuesday. That test was designed to perform testing on “flutter susceptibility” and also pilot proficiency, according to the flight logs. Why this sudden surge in testing isn’t clear, nor is there any indication from the company when they’ll be ready to start powered flight tests of SpaceShipTwo.